GiftPlanner lets you easily keep track of your gift list and events. Keep all your planning information, including gifts and ideas, stores and prices, purchase statuses, order and tracking numbers, images, links, and more, in one convenient app! GiftPlanner features an innovative “bookmarklet”, letting you browse the web on your device and send pages directly to your list to be imported as new gifts without interrupting your shopping experience. For offline shopping, use your device’s camera to scan barcodes and automatically have information about a product filled in for you! 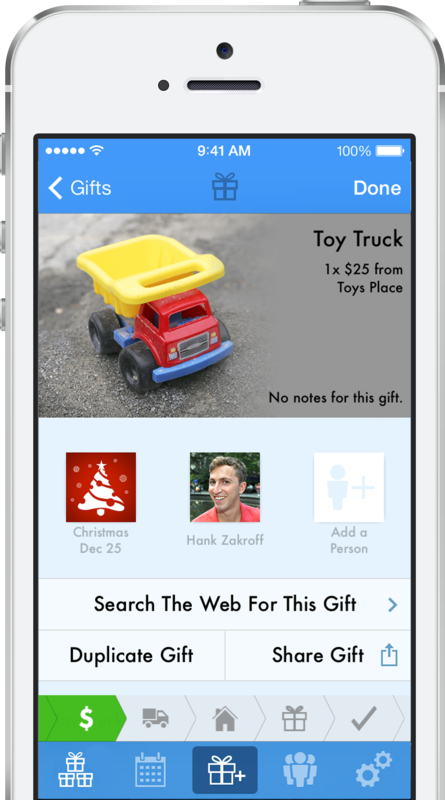 An available syncing feature (with in-app upgrade to GiftPlanner Plus) lets you keep your gift list synchronized between your iPhone and iPad (or iPod Touch)! Free for iPhone, iPod touch, and iPad on the App Store! Track all of your contacts’ information: Birthdays and anniversaries, addresses, clothing sizes, gift ideas and wishlist links. Remember which gifts you want to get, where to get them, and who they’re for. Even keep track of shipping status! 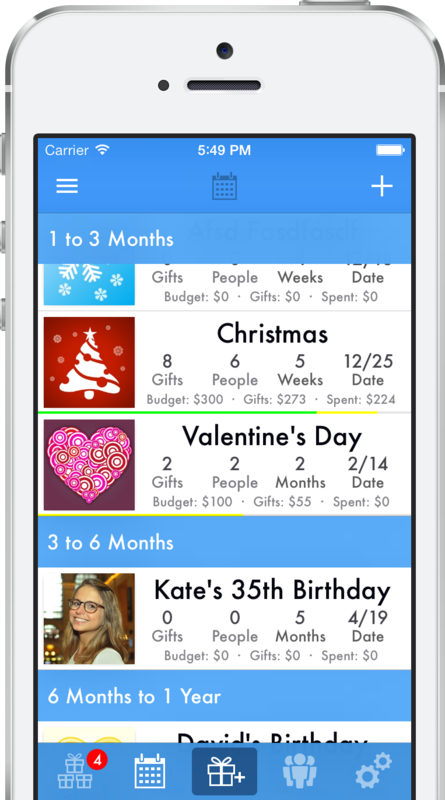 Set budgets for events, keep track of which people from your contacts you still need to get gifts for, and export shopping lists. Add gifts to your list while you’re browsing the web, whether you’re using your desktop or laptop computer, or your mobile device! GiftPlanner lets you attach photos to your gifts, and even helps you keep track of which wrapped present is which! Protect your gift list from prying eyes using an optional passcode lock! Keep holiday spending under control with budgets and price totals for events and people. Progress bars help you keep track! Export convenient, printable gift list reports for events or people to be used as shopping lists, checklists, and more! Waited too long to buy a gift? Send gift cards easily by email or SMS, without leaving the app!